Houchin Community Blood Bank is one of the early adopters of a new technology called the Illuminator, that is reducing bacteria and pathogens in platelets. BAKERSFIELD, Calif. — Houchin Community Blood Bank (HCBB) is one of the early adopters of this new technology, that reduces bacteria and pathogens in platelets called the Illuminator. As the only facility in Kern County to have this machine, the HCBB is helping patients battling cancer not only have safe infusions but stay closer to home during their treatment. Whereas before the technology came to Bakersfield, patients would have had to travel to Los Angeles or further. "We believe in keeping our healthcare as local as possible. Holistically we believe it's better for the patient. We think it's important to have the safest blood product we can. If something comes out to say it's the safest product we get it for our community. We are here for our community. Without our community we would not exist so to us it's critical, it's mission one to keep our patients as safe as possible because they are our friends and our family," said Galen Kline president and CEO of HCBB. Since cancer patients have a compromised immune system, even a small amount of bacteria in platelet infusions can be fatal, said Kline, which is why this technology is so essential. To remove the bacteria and pathogens, platelets have to go through a complicated process. First, the donor spends 45 minutes to two hours giving their platelets, as a machine filters the red blood cells from the platelets. After the platelets are collected, they are mixed with a solution that, through the Illuminator machine, attaches to the DNA of the bacteria and viruses. The bag of the mixture is then placed in the Illuminator machine. In just four minutes the machine deactivates any virus or bacteria that may be in the sample. Before the platelets are sent to the hospital, the solution is removed from the platelets by sitting in a sponge-like material for 12 to 24 hours as a machine moves the bag around. "Any pathogen that might exist in that blood cannot reproduce any longer, so it can't hurt anybody anymore," said Kline. According to HCBB, the blood bank transfuses about 8,000 platelets a year in Kern County. There is a constant need for platelets because they only last for five days on the shelf, compared to the 42 days that red blood cells last. "The community needs you; cancer is not going to stop anytime soon. We're working really hard to cure cancers, and there are a lot of really exciting treatments, but for right now patients need platelets. 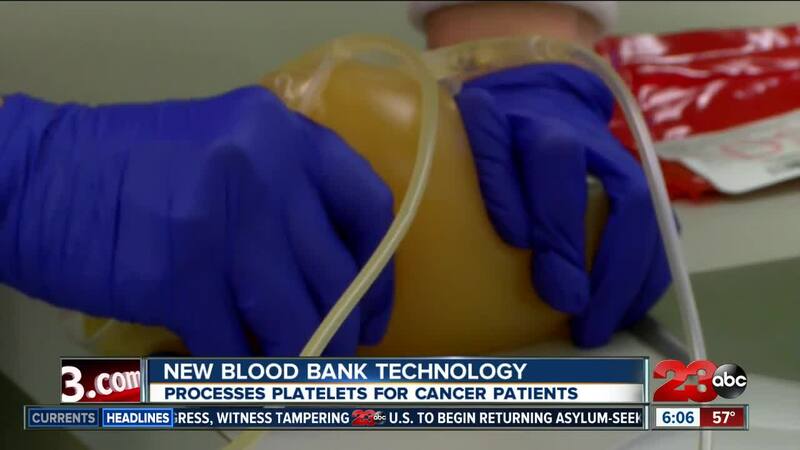 If you know somebody with cancer, there's almost 100 percent chance they are getting platelets," said Kline. If you are interested in donating blood or platelets, visit Houchin Community Blood Bank on their website . If you have questions about your eligibility to donate blood, you can call the HCBB at 661-323-4222 or toll-free 1-877-364-5844.